This home had a sparse, modern kitchen and the new owner wanted a farmhouse feeling. It was an easy change by switching out the light fixtures, adding new marble, and covering the existing vent hood. The modern kitchen they disliked is now a thing of the past! While there was nothing wrong with the existing kitchen, it wasn’t the farmhouse style kitchen the homeowner wanted. The homeowner wanted the kitchen design style to trickle into the dining room, so that is exactly what we set out to do. Let’s take a closer look. 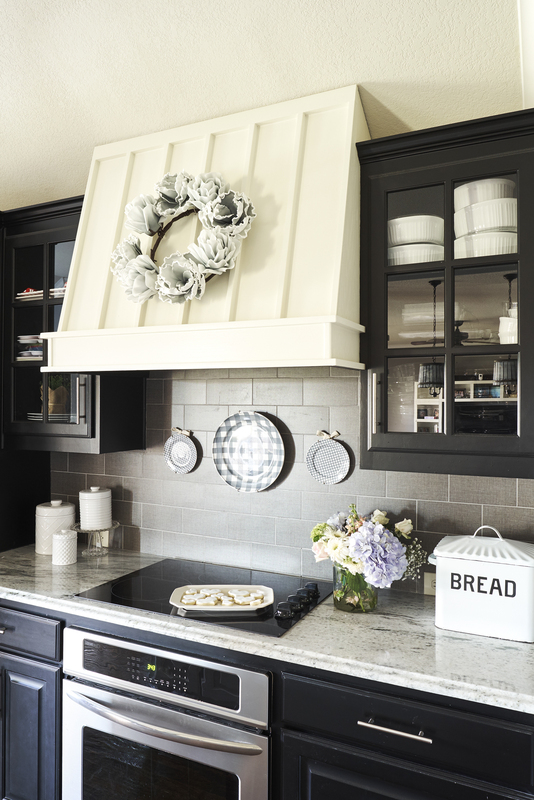 It starts with an amazing farmhouse vent hood. I love this so much, I tried to fit in my shirt and smuggle it out, but it didn’t work. I drew the design and showed photos to the Woodworker and he created this masterpiece! Farmhouse love!!! The homeowner wanted to add extra seating to her existing dining room table, so we added banquette seating. I added a cushion in a chevron pattern to offset the uniformity of the grays seen throughout the kitchen and dining room. I embellished the cushion with a bright pink blanket along with floral and patterned pillows. This sitting area can be used for eating, relaxing and reading! One other thing I really like about this room is the crown molding. 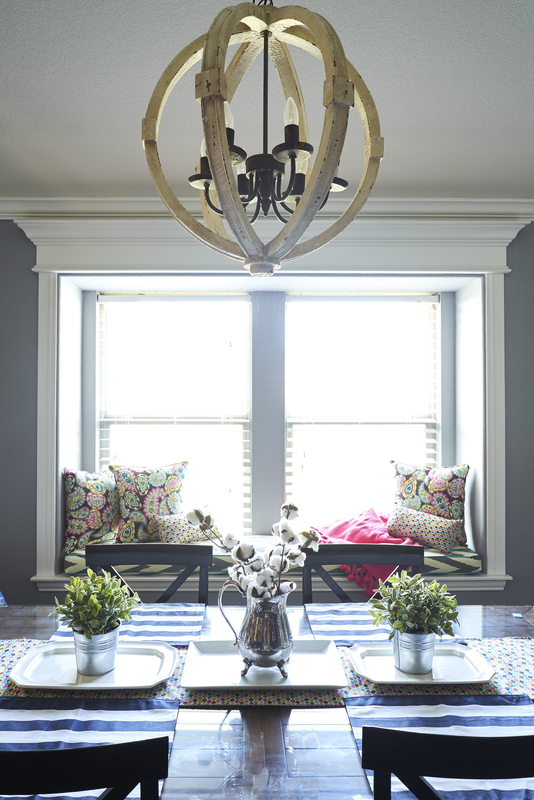 The crown molding around the banquette seating is more detailed drawing the eye. It seems to highlight the banquette seating. Gray was the color of choice for this homeowner. Not only is gray displayed on the walls, but it is also seen in the back splash and marble counter top. Using multiple shades of gray make the room appear larger and it also gives a rich appearance to the space. The off-white accents used in both the kitchen and dining area are in sharp contrast to all the gray and draw the eye. In the kitchen, you will notice the black cabinets. The glass panes in the cabinets allow for a peek inside. The dishes seen through the glass add diversity to the kitchen. My favorite item in the kitchen is the chandelier of which we used three of. They give an elegant vintage look above the marble counter. Remember, when you really like something don’t be afraid to use more than one of that favorite thing! 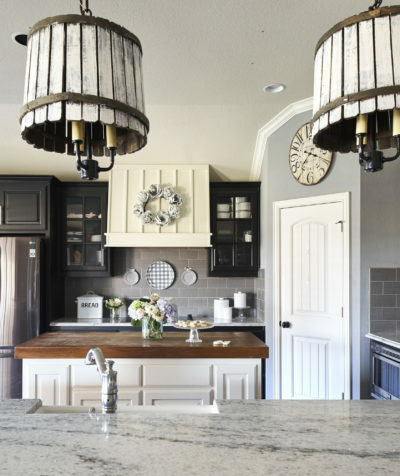 The chandelier for this space also places its’ farmhouse stamp on this room. I love the circular detail in the chandelier along with the candlestick lights. When this client called and told me she was a cookie maker, and needed a landing spot for all things sugar, I was in. But only if she would let me taste test the merchandise, right? I mean, I can’t really design a room for cookies unless I know what they taste like. That only makes sense. The homeowner really likes pink, so we used a velvet pink office chair and a striped pink and white carpet in this room. There is also a shade of pink in the geometric patterned rug. By the way, geometric patterns are on trend! The wall gallery displays evidence that a baker is using this space! The bakery sign is bold and farmhouse. Across from the bakery sign are peg boards that hold cookie cutters. These look cute on the wall, but also provide storage and easy access. The white sleek desk looks great with the gray walls and pink accents in this room. It has a cute striped holder that is normally used for pens, pencils and scissors, but this room called for whisks and spoons. The open shelves above the desk are both decorative and useful for storage. I placed a few jars to hold supplies. I also added additional storage by placing a small black cabinet that was perfect for this small angular space. Speaking of angular, this space has a unique layout. I had to get creative when deciding on placement and furniture. Notice the white wooden topped table. We placed it at an angle to provide optimum space for this room. My favorite decorative item in this room is the black and white awning above the window. This awning is definitely unique. Normally, awnings are placed on the outside of the house above a window, not inside. Since this baker wanted a room that looked like a bakery I knew I had to add this awning to the inside of this room. It gives a whimsical look to this baker’s craft room. Doesn’t this make you want a cookie? I do! But maybe that’s because I always want a cookie. 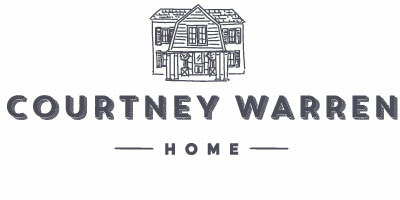 Check back soon to see some other recent projects!